In this second part of the House of Stone walkthrough, get clues and spoilers for more hidden object rooms and puzzles. Note: For more details, click on the images to see them displayed in a larger size. 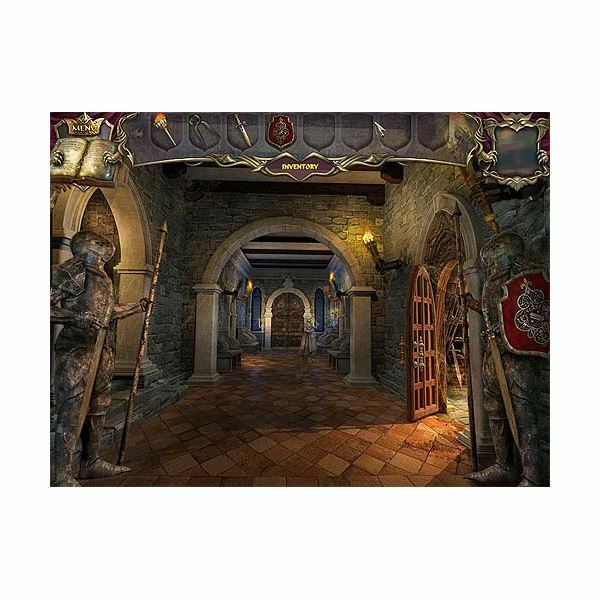 The stone nanny is at the end of the hallway past the throne room and the knight statue. She has been petrified. There is nothing you can do about this for now. Click on the pieces of paper that are lying on the ground next to the nanny. Notice the empty frame on the right wall. This is another puzzle for you to solve. Click on your inventory and retrieve the torn pieces of the painting. 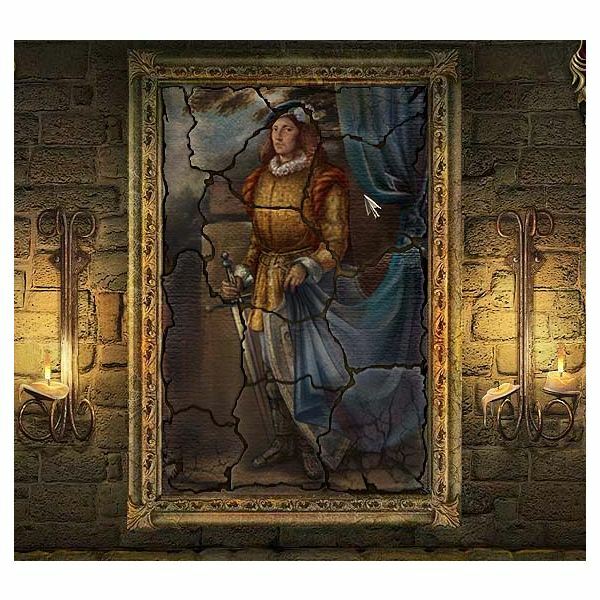 You will need to reassemble the picture by placing the pieces in the appropriate location on the frame. See the image to the left. When completed, it will reveal a painting of the last prince of the Royal House of Stone which shows the royal coat of arms on his shield. This information is then logged into your journal (which will become useful in another puzzle). Each of the rooms located beyond the knight statue are locked. If you cannot this area, check out part one of this Echoes of the Past walkthrough for details. The door on the left requires two steps to open it. First, you will need to uncover the lock by using the tongs found in the hidden object room in the Armory. Click on the loose bolts to remove them. This action will uncover another puzzle. It is a bit tricky. You need to move the stone blocks and gears to release the lock. If you are unable to solve it, you can press the “Skip” button next to the magic mirror when it becomes highlighted. This puzzle is located beyond the Knight Statue doorway. It is the locked door towards the back of the room. 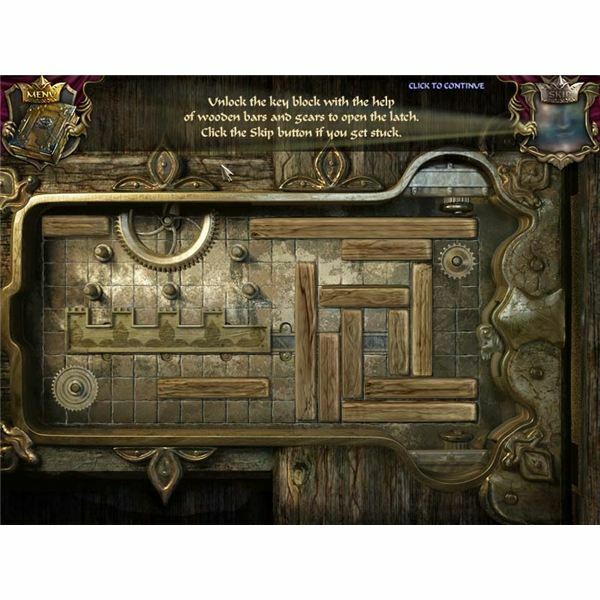 To unlock it, you will need to solve the Coat of Arms puzzle. 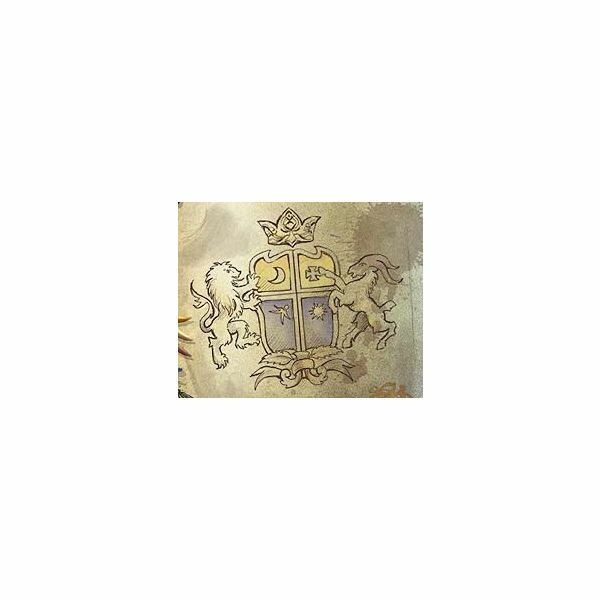 Look at the Coat of Arms image displayed below or locate it in your journal. It will display the correct color, animal icon, crown and decorative base you will need to set the puzzle to in order to open it. Click on each section of the coat of arms to change its settings. The top row of the coat of arms is yellow and bottom row needs to be purple. The left animal icon needs to be a lion, the right animal icon needs to be a goat. Finally, click and change the crown and decorative base to match the one displayed in the image. 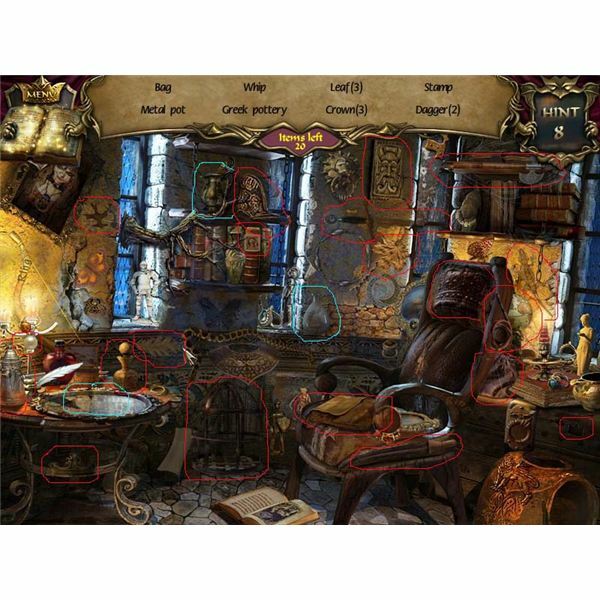 Once you complete the puzzle it will unlock the Prince’s Study which has a hidden object game area along with another puzzle to solve. 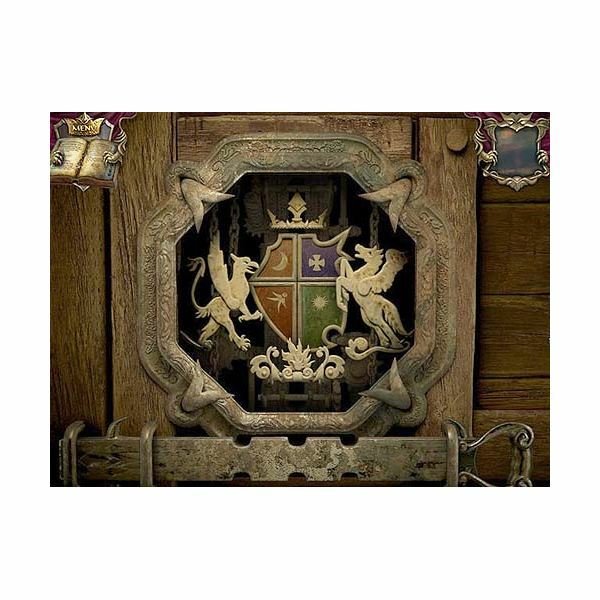 If you have unlocked the Coat of Arms puzzle, you will have access to the Prince’s Study which is in a section of the Court Taylor’s room. 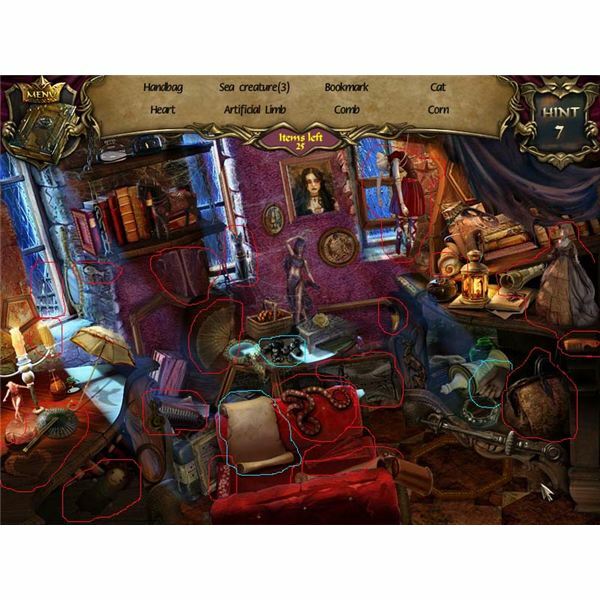 Click on the sparkly icons to access the hidden object room in this area. You will need to find a variation of of the following items to solve this puzzle (20 in total). Click on the image to the left to see details of their locations. Perfume, Crown (3), Bas-Relief, Cage, Dagger (2), Globe, Axe, Steel Helmet, Pearl, Whip, Lizard, Bag, Metal Pot, Greek Pottery, Leaf (3) and a Stamp. It also includes two special items (highlighted in blue) – Beaker and Jug Shadow. Note: For the Jug Shadow, the Jug will need to be placed on the silver tray as indicated in the image. Once done, a shadow will appear. Click on it to complete this task on your list. The Princess room is located behind the door with the wooden lock and gear puzzle. 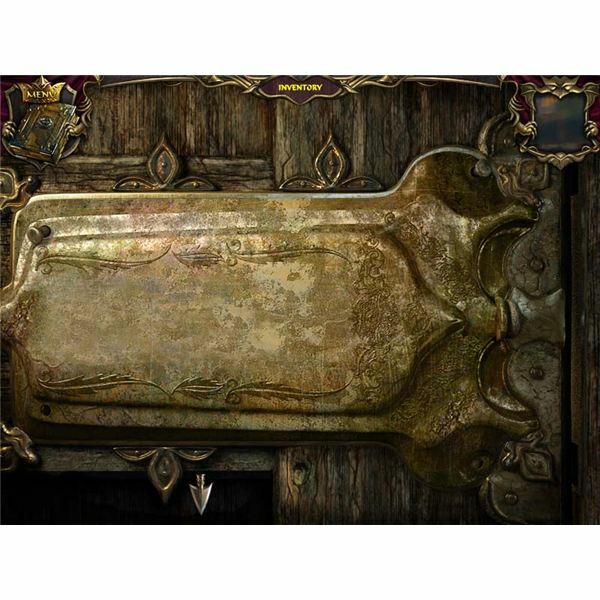 It has a hidden object area that can be accessed by clicking on the sparkly icons. You will need to find twenty five items to solve this puzzle. These may vary slightly as some appear to be random. Click on the image to the left to see location details. Handbag, Heart, Sea Creature (3), Bookmark, Cat, Artificial Limb, Comb, Corn, Corset (3), Fang, Doll (3), Fan (3), Snake, Spyglass, Ladder and Clef. It also includes special items that are needed to uncover the Handprint and Lever (highlighted in blue). Note: For the Handprint, you will need to smudge the glove with the coals located on the table. Then take the smudged glove and click on the piece of paper. It will make a handprint that can be clicked on to complete this task. Screenshot images for the Echoes of the Past Royal walkthrough were created by Sheila Robinson.